Crochet has become my new addiction....yes I know it could be worse and much more expensive so I am quite happy about it. Lucky I have pretty much a never ending supply of pure wool as I paint it myself but books....there are so many of them. I have been tempted to buy a couple.....and will show you them when they arrive. I learnt to crochet when I was a child....I can still remember the pale pink and white baby wool blanket I crocheted when I was about 10. I have no idea what happened to it. So I was very excited last week when I learnt how to do other stitches. Last Saturday at the MILK and HONEY CRAFT MARKET, Mary one of the other stall holders showed me how to do the double stitch and I was off......I created round, rectangle, frilly bits with chain and kept pulling it apart to do more. I was hooked, so to speak. So you can imagine my excitement and happiness when I finished my first pair of wrist warmers. (at almost midnight because I couldn't put them down). I used a 5mm bamboo crochet hook and 8ply hand painted Autumn Rainbow wool and it took less than 50gms. Check them out.....what do you think? 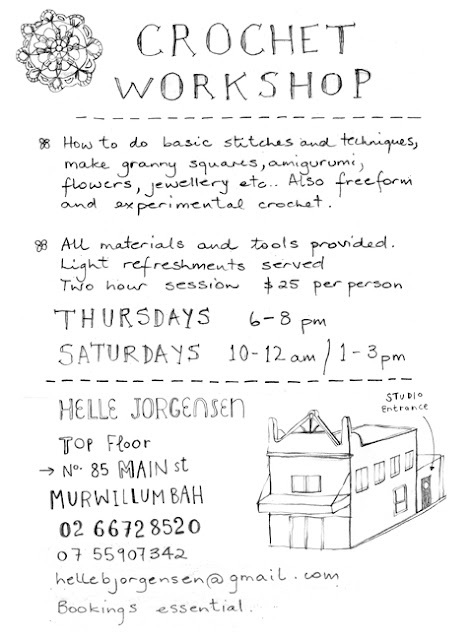 Coincidently, another stall holder at our market, Helle Jorgensen was offering crochet workshops starting yesterday and running for three Saturdays for two hours learning how to make flowers and experimental and freeform crochet techniques......yah!!!! so of course I just had to go. I went along with Julia (another amazing, creative friend) and this is one of my new creations. Just a quick look at Helle's gorgeous studio in Murwillumbah and her amazing creations. Helle works alot crocheting with plastic bags and receives them from all over the world so she has an amazing selection of colours. On her blog there is even a PLASTIC BAG YARN TUTORIAL....check it out and you can also see more of her photos on her blog too. And just in case you are in the area and want to join in the fun, here is Helle's workshop poster. Oh if only I could just sit in the sun today and crochet and crochet......fortunately/unfortunately I have more painting of wool to do so it will have to wait. I will show you more soon. Hi.... I've just popped over from Hinterland Mama's blog! Have checked out your website - you certainly have a lot of goodies on there and I'll be back! I learnt to crochet in my teens (an old lady in the bed next to me in a tiny hospital taught me!!) and it's a craft I still enjoy today, although I don't get to do it often enough! I've tried knitting but oh boy it's just too slow for me and I never stick at it long enough to get faster!! You live in a beautiful area - my lovely sister lives up your way and when ever I visit I wonder what I'm doing here in Tas!! Wat the?? Nice Bloggershpere Jo...When were you gonna tell me bout this stuff Eh! You know I'm an important man about town now and I need to know all the latest! Thanks for the mention Jo....... good to hear you're hooked!! it was so much fun, looking forward to next week.